Slender-tailed nightjar is a common and widespread species in dry areas below 2000 metres above the sea level. Very similar to Gabon (Square-tailed) nightjar, but the tail is often paler and greyer, with central rectrices extending beyond the others. It has a habit of flying low and alights on bare ground, rock or stump, often flying only on a short distance after being flashed. Commonly hawks insects around lights. It sings from the ground or from a low tree. Roosts on ground under scrub cover. 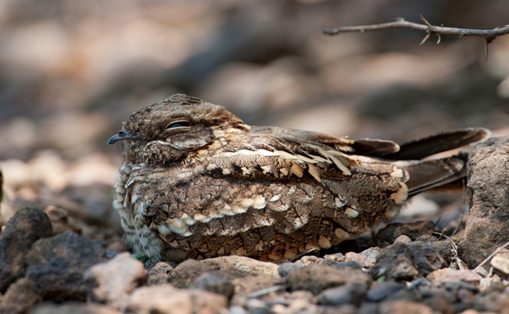 The Slender-tailed nightjar is common and widespread resident in dry bush and ranges throughout the coastal lowland, Rift Valley, Meru and Tsavo National Park.